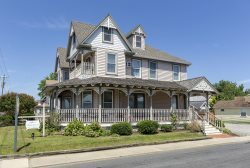 The Inn at Poplar Corner - A One-of-a-Kind Chincoteague Vacation Experience! Just wonderful , responsive, good communication. We did not have any problems during our stay but would not have hesitated to call. Peaceful and comfortable. You don't need anything else. Elaine called back or emailed when we needed questions answered, and knew all the details about the property. Aside from a few small deficits of things in the kitchen, it was absolutely great. There was so much room, the electronic key was very convenient for many people coming and going. Not having to go to an office for check-in and out was a bonus. Closeness to downtown made walking there easy. We were able to fit our 5 small cars in the driveway. We loved how there were drying lines in the screen porch. We usually have to hang our own rope somewhere to dry towels. The outdoor shower was the nicest we have ever seen.The property was so pristine and beautifully appointed. We would love to rent next year, if our available dates work out. Elaine was a pleasure to work with - always friendly and responsive whenever I contacted her. Absolutely wonderful place to stay! All of eight of us had a great time, and we have already discussed coming back. I looked at many properties before discovering Stoney Point, and it was by far the best property for 8 adults. Beautifully decorated and maintained as well! Elaine was awesome and always made herself available to me. She always made me feel like I was her number one priority. We had an awesome vacation at your property. Lance and Elaine were very accommodating and helpful. Always very informative. Excellent customer service and made us feel right at home. Perfect for our family! We enjoyed playing cards and games ea h night in the spacious living room and the privacy of bring away from the beach at night. The neighborhood was very quiet and the teenagers had plenty of room to play football and volleyball in the yard daily after a great day at the beach. We w joyed being just a few minutes drive from the beach and exploring the local restaurants as well as the lighthouse. Being provided information about our upcoming stay through email was great. It turned out to be a nice little house. So light and airy with the many windows. The view of the lighthouse was a bonus.